A while back I mentioned Maurice LeBlanc's series of books about the Gentleman Burglar Arsene Lupin. In a few of the Lupin stories he came up against Sherlock Holmes, though his name was originally altered to prevent legal action by Holmes' creator, Arthur Conan Doyle. The first major work featuring the two together was a book called THE HOLLOW NEEDLE which is a very good story but actually doesn't have that much of Holmes in the tale at all. 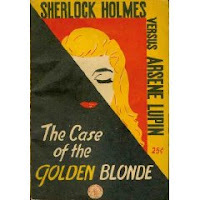 But a follow up story known variously as THE BLONDE PHANTOM, THE BLONDE LADY or THE CASE OF THE GOLDEN BLONDE, has Holmes more steadfastly entrenched in the goings ons. This version, THE BLONDE LADY is translated from French to English by ALEXANDER TEIXEIRA DE MATTOS in 1910. This book is actually made up of a novelette and a short story, combined to make this whole narrative. The main body of the book is the main titled THE BLONDE LADY with a short story at the end called THE JEWISH LAMP. 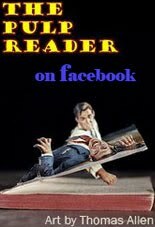 A further report on this novel can be found in this review of the BlackCoat Press book ARSENE LUPIN VS SHERLOCK HOLMES: THE BLONDE PHANTOM, from this pdf issue of the Holmsian magazine DISTRICT MESSENGER. "Arsène Lupin vs Sherlock Holmes: The Blonde Phantom by Maurice Leblanc, adapted into English by Jean-Marc & Randy Lofficier completes the account begun in Arsène Lupin vs Sherlock Holmes: The Hollow Needle. Here we have the two novellas, 'The Blonde Phantom' and 'The Jewish Lamp' (originally published together in English as The Arrest of Arsène Lupin,The Blonde Lady or The Fair-haired Lady, depending on the publisher) along with two short stories by the translators, which neatly fill gaps in the saga. The Lupin-Holmes tales appeal to me for several reasons. The protagonists are remarkably evenly matched; unlike Chief Inspector Ganimard, Holmes really gives Lupin a run for his money, though of course Lupin comes out on top. The narrator (named as Leblanc himself) admires the detective but is firmly on the burglar’s side, and the portrayal of Holmes and Watson is refreshingly different from that given in the Canon, as Anthony Boucher pointed out long ago. Moreover, the plotting is ingenious, and there’s that touch of the outrageous that British writers didn’t seem to master fully until the television age (when it flowered gorgeously in The Avengers). There’s nothing actually impossible in the exploits of Arsène Lupin, but there’s a great deal that’s improbable, and the better for it. Maurice Leblanc was not allowed to use the name of Sherlock Holmes in the original publications; he resorted to Herlock Sholmès, which a British publisher cleverly transformed into Holmlock Shears. But how nice to encounter Holmes under his real name in this extraordinary continuing duel." So whether you listen to this audio or not, if you are a fan of Lupin and Holmes I'd suggest tracking down the book talked about in the above review as it adds a couple of stories to fill in LeBlanc spots. or stream the M3U playlist.